You can tell a lot about a person’s growth by the difference you see in his writing. Not just in his writing but also by the manner and the topics he chronicles about. 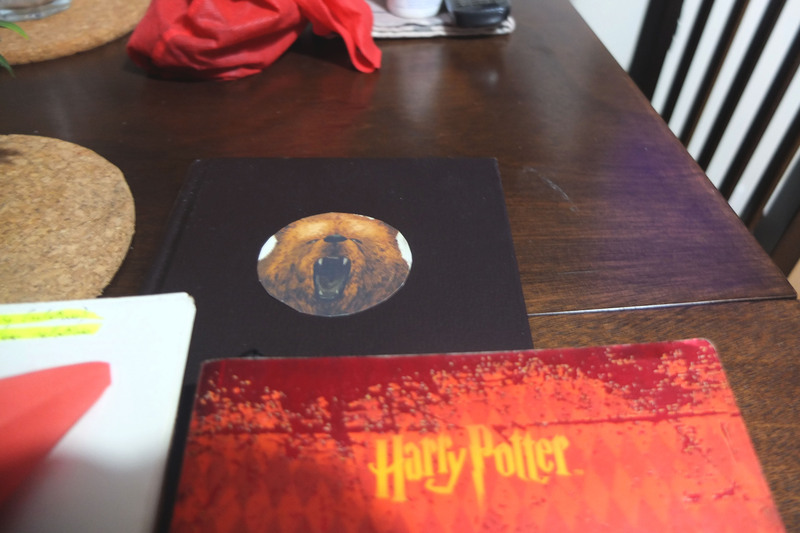 Last night, I picked up my nine-year-old Harry Potter journal that my Mom gave to me as a pasalubong from the first time she went to visit our relatives in the States. This was after I opened and closed, opened and closed, opened and typed and saved as draft and closed, the Add a Blog Entry page here for the past couple of days. Or weeks. I wrote on it again after my last entry dated August 2016. Six months ago. 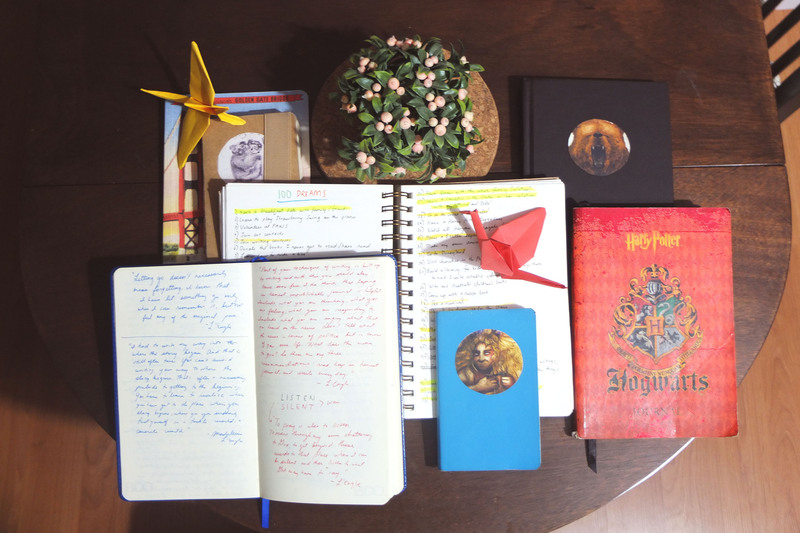 That’s the scenario in my Harry Potter journal… Sometimes, I have written five entries in a month. Sometimes, there’s a wide gap. I wrote there in my private journal, because I was feeling overwhelmed about writing online again. I wanted to write something here about a particular topic, yet I did not know what I should write about. Should I write about my life for the past years, what’s currently happening, silent prayers, my art and process, my fears, my journey to a healthier lifestyle, a new career path? I did not know. I just missed writing terribly. Although it was a sunny day, there was wind to make up for the heat. Although we arrived when the doggie hot air balloon has already taken off probably several minutes ago, we still were able to see many of the remaining ones from the car. Although we had to wait for a while before getting to enter, I was with two very good friends whom I have always enjoyed being with ever and learning from since we were young. I have been writing since I was in elementary school. I recall Disney books especially The Little Mermaid and Little Golden Books, with traces of crayon here and there. There is also my first paperback of Harry Potter and the Sorcerer’s Stone and Karen Hesse’s Out of the Dust from my Nanay and Tita Marissa. Reading, in its own big part, contributed to honing my skills in writing. Of course, seven years of taking summer journalism classes under Sir Sergio Ontuca in OCNHS with my closest friends in elementary and high school and joining the DSPC yearly helped immensely. When I read my old writings, I can say that I still had a lot to improve then. I looked up to my friends who were exceptional in their own chosen categories. Ever since, I’ve been in the school paper, even in college. This was when I learned so much, not only in writing but also in taking note of what is important in life. It was a turning point in my life, and I am thankful for all the friends I’ve met there who have taught me indispensable lessons. Besides this, I also started blogging back in Blogspot when I was 13 years old. I recall pouring over cute themes and using them afterwards to partner the content of my blog. It’s good that I remember one URL I used back in second year of high school – I read some of my entries, and it was so embarrassing! Oh well, we all went through that phase. And before I knew it, I have been doing this blogging thing and changed addresses and transferred platforms, while I was growing up. I am about to turn 23 this year, and I am still at it, just as other people of my generation are. I’ve been from Blogger to WordPress to Tumblr, and here I am in WordPress again. (I’m still using my Tumblr for a specific purpose though, and I have met kind-hearted and thoughtful friends there!) I cannot count how many blogs I’ve kept in the nine years that I have been doing it, but the most I’ve written are in my Tumblr. When you read them, you’ll see some of my most important moments and how much I’ve changed. It’s like a time machine. Let’s not talk about journals too which hold more personal matters compared to blogs. Mima gave me as a pasalubong this Harry Potter journal that I have been using for seven years already. I don’t get to write their regularly, but when I have the time and if I need to put something down on paper, I write there. The interval sometimes would be a month, three months, or nine months, and I’d just be surprised to see how much I changed based on how I wrote and what I wrote about. These days, I just keep ending my entries with silent prayers. 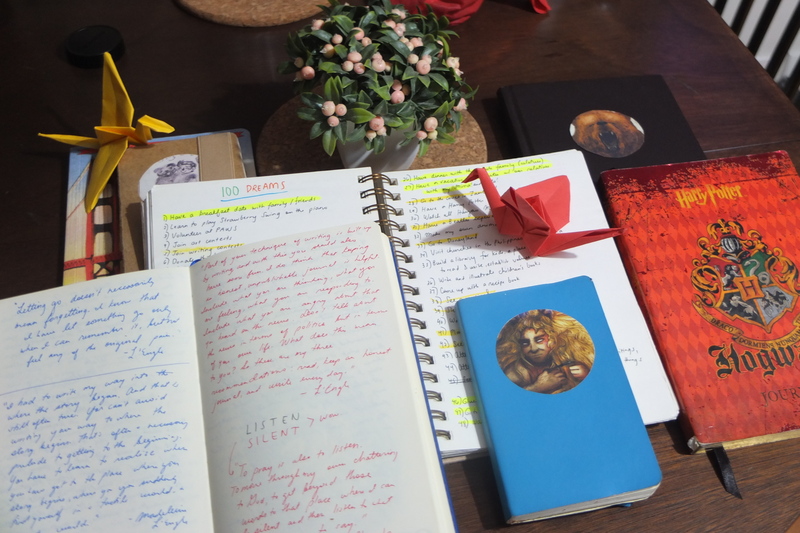 Other notebooks would contain little snippets, reminders, quotes that point me to Christ, and drawings. One contains heartfelt and desperately written prayers, ideas, tips and advices in art, and a plethora of other random things. Now that I am older and the age today has so many distractions telling us to do this and do that, I need to remind myself of why I still write. Either it’s on a blog or a personal journal, I need to keep myself in line with my faith, beliefs, and values as a person. A purpose bigger than myself now has to drive my writing. I am thankful for the ordinary miracle in coming home safely every day after work. It is a fact that sometimes I can take for granted. For us to arrive safely to our homes with our families is in itself a big blessing. I am thankful for the time that my Dad and I were able to spend this month. My Dad only stayed here for two weeks. I wish it could have been longer; nonetheless, I am glad. It is not about the length that you are together, rather, it is about how you spend the time that you are given with each other.